Viper’s Blood is a compelling and dark chronicle of war, lightened only briefly by the camaraderie and affection between soldiers. But this is now not really a war of pitched battles. Those are in the past and still to come. Instead, there are skirmishes, the seizure of towns, the slaughter of communities, the scramble for land and roads. And when Thomas and his mean leave France for Italy they find no peace. The cities there are constantly at war with one another, the situation merely aggravated by the neighbouring Hundred Years War. 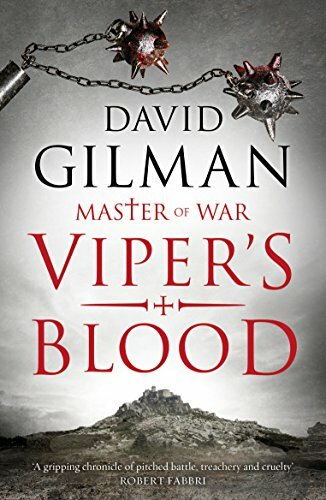 Viper’s Blood is an exciting, bloody and well-written tale of Europe at a time of terrible crisis. Surely, there can have been few worse times in history in which to live than the mid 14th century? It’s harrowing at times, chilly in others, and, perhaps, is a little too long, but it is certainly a fine addition to a series that continues to bring these cruel years to life in such rich and meticulous detail.